Published on August 6, 2018 by Wade Shepard Follow me on Twitter here. 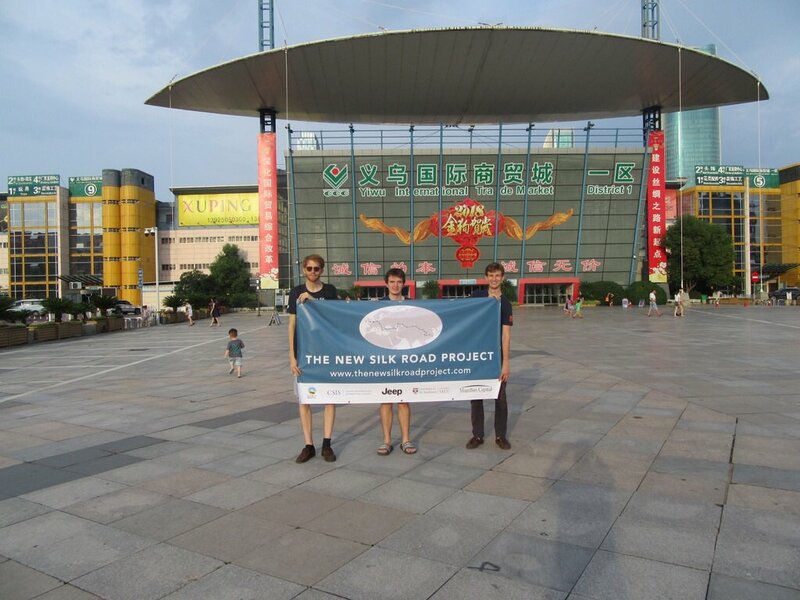 Over the past couple of months we’ve been following the story of a group of British university students traveling by Jeep along the New Silk Road, from London to Yiwu. I was supposed to have traveled half of the journey with them but decided to spend this one on the sidelines — I ended up in Montana instead — and helped out where I could: introducing contacts and arranging site visits. Throughout the course of their journey I kept in touch with Charlie, the ultra-persistent team leader, almost daily — answering questions, giving advice, sharing updates of their progress on my social media channels and on this blog — and I’ve been kvelling about him throughout. He’s only like 20 years old but has already traversed more ground and overcome more challenges than many other travelers would in a decade. This was his second trip down the Silk Road — the first was by bicycle. They made it. They just arrived in Yiwu on the coast of China and unfurled their banner for the last time. Unfortunately, their Jeep did not make it with them. After repeatedly being promised by the Chinese authorities that they would be able to get Chinese plates and a temporary driver’s license without difficulty, when they arrived at the Chinese border — after driving across other Silk Road countries like Europe, Turkey, the Caucasus, and Kazakhstan without so much as a bureaucratic hiccup — they were told another story: Nope, you’re not bringing that Jeep in here. This is how the Belt and Road works in practice. China, even with its new international face, is still the same old China: contracts are always renegotiatable, there is never a such thing as a done deal, and you have to take anything anyone says at face value because more than likely they’re talking farts. But losing his form of transportation didn’t hold Charlie and company back. They sent the Jeep back to the company from Almaty and completed the rest of their objectives by public transport. They’re now in Yiwu: the last stop on a 12,000 kilometer expedition.